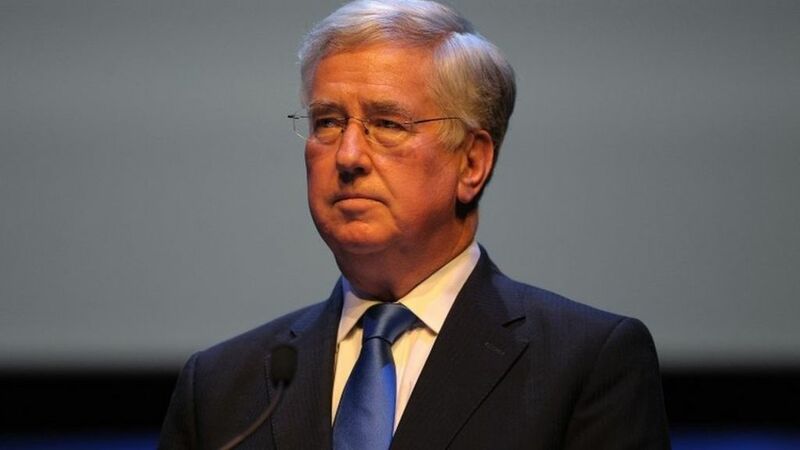 Russia is to blame for “every civilian death” in the chemical weapons attack last week in Syria, Defence Secretary Sir Michael Fallon has claimed. Sir Michael, writing in the Sunday Times, said the Kremlin was responsible “by proxy” as the “principal backer” of President Bashar al-Assad’s regime. It comes after Foreign Secretary Boris Johnson cancelled a visit to Moscow to meet his opposite number. The attack has been widely blamed on the Syrian government. Sir Michael said last Tuesday’s gas attack was “barbaric, immoral and illegal” and the response of air strikes from US President Donald Trump was “the right call”. Referring to Russia, Sir Michael wrote: “This latest war crime happened on their watch. The defence secretary said Syria needed a government in which Mr Assad played no part. He acknowledged achieving that was “not easy, but not impossible”. “By sending Tomahawk missiles to attack the airfield, aeroplanes and equipment believed to be involved, it has sent a strong signal to the Syrian regime to think twice before using gas in future,” said Sir Michael. Sir Michael said Mr Assad must depart and the search for stability begin. “Someone who uses barrel bombs and chemicals to kill his own people simply cannot be the future leader of Syria,” he stated. Mr Johnson, who called off a trip to Moscow on Monday, is attempting to co-ordinate a united response from the G7 group of industrialised nations, whose foreign ministers meet in Italy this week. The Russian foreign ministry said Mr Johnson’s decision not to visit Russia was “absurd”. US Secretary of State Rex Tillerson will visit Moscow as planned after the G7 meeting in Italy this week. Eighty-nine people, including 33 children and 18 women, died in the suspected nerve agent attack in the rebel-held town of Khan Sheikhoun on Tuesday. The figures come from Idlib’s opposition-run health authority. The country’s government denies using nerve gas. On Friday, the US carried out missile strikes on a Syrian air base it says is suspected of storing chemical weapons. At least six people are reported to have died. In response, Syria’s ally Russia accused the US of encouraging “terrorists” with unilateral actions. Moscow has further promised to strengthen Syria’s anti-aircraft defences and it is shutting down a hotline with the US designed to avoid collisions between their air forces over the country. Iran’s President Hassan Rouhani has said “terrorists are celebrating” the US strikes on the air base. But he also backed calls for an independent inquiry into the suspected chemical weapons attack. Mr Johnson’s visit, for talks with his Russian counterpart Sergey Lavrov, would have been the first by a UK foreign secretary in more than five years.